We were both quiet on the penultimate day of our ride. Put it down to those mixed feelings we always have as a tandem trip draws to a close - sadness that another adventure is about to end, relief that we have managed it safely, joy at the thought of seeing old friends and returning home, and indecision about where we might go next time and whether we have the energy for it. Malaysia has been an uplifting tour for the most part. I say most part because the one issue that has challenged us has been the weather - the combination of heat and humidity. Many days the temperature has been in the low to mid 30s and the humidity up over 70%. Put the two together and the sweat pours off us and we have to stop every few kilometres for cold drinks. 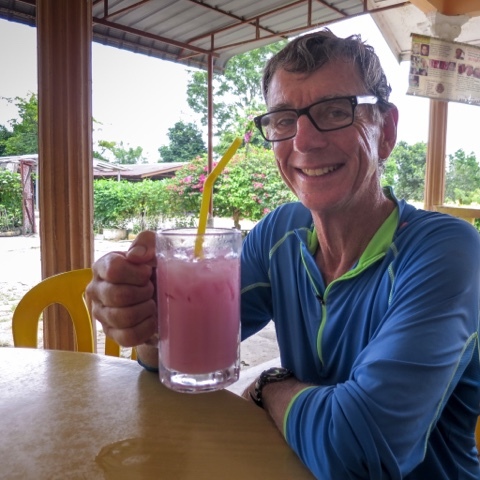 In the evenings when we have fancied a beer, often it's not been available in the mostly dry eastern side of peninsula Malaysia. That's the downside. The upside has been pretty much everything else. The sealed roads, the cost of living, the food and the friendliness of the people all get a tick. English is widely understood so communication has been easy. We were able to leave the tent at home knowing that accommodation stops were within a day's ride of each other, most of the time. 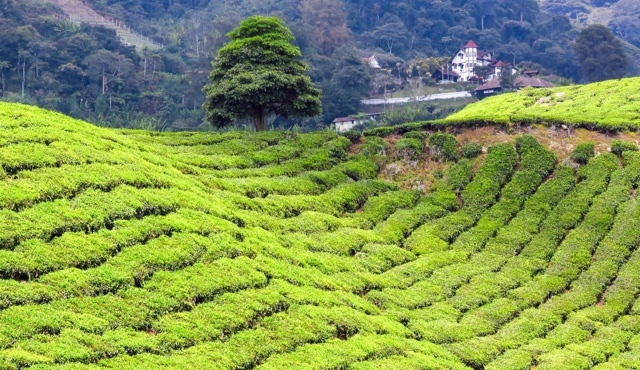 For cycle tourists, Malaysia has a lot going for it. The end of this cycle trip - about to arrive in Georgetown, Penang, by ferry. 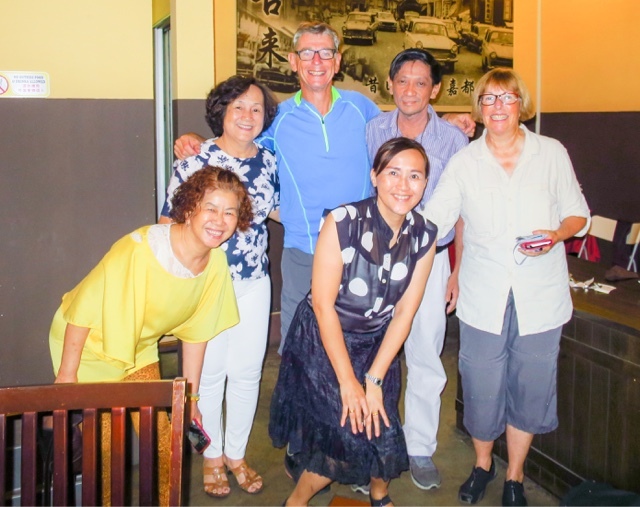 Dining out Penang style with a wonderful crowd. 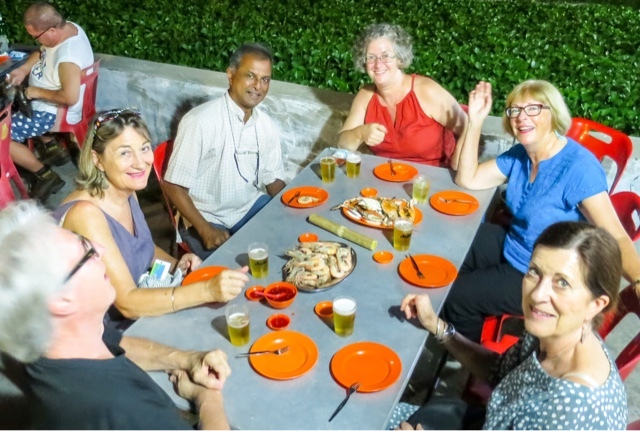 L to R: Simon, Annabel and Suku (old and hospitable friends who are looking after us), Michelle, Judy and Gail. Of all the people we have met, one stands out for me. The following is taken from my notes on the day, as we made our way slowly over the East West Highway. "A car slowed and stopped ahead of us. Assumed it was just someone waiting to take a picture, but we were waved to a standstill. "The driver popped open the car boot, insisted we share a big blue bucket of mangosteens. Whipped out a rug and spread it on the grassy roadside and broke open the first of the purple, smooth skinned fruit. Inside were segments of white flesh - delicious. Bit like nectarines. We gorged ourselves. Judy with Yahaya Mohd Yussof. Sometimes you just click. This was one of those occasions. An absolute gentleman, he insisted we share some of his mangosteens. "His name was Yahaya Mohd Yussof, father of five, retired from the navy. During his time in the service, he had spent a year in Italy where he had the opportunity to visit Milan, Rome and Venice. Daughter (oldest) is a doctor, then comes a teacher, an army officer, an air force officer and the youngest is a nursing student. "He was a lovely, warm man and we loved meeting him. He brought out a plastic container of sweet black coffee and we shared it, drinking from the container. 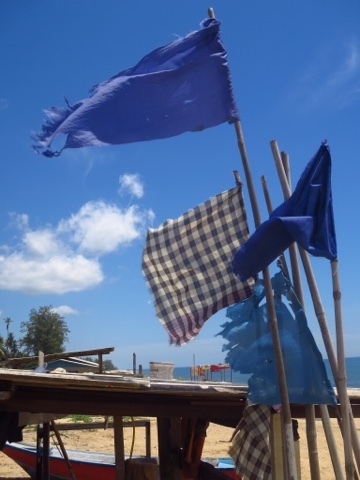 "We told him about our travels and he quizzed us about our safety in Malaysia. He seemed concerned, then relieved when we told him we felt very safe here. "When it was time for all three of us to get back on the road, he and I shook hands. He and Judy refrained but touched their right hands to their hearts, which is the custom and felt entirely appropriate. "Finally, Yahaya and I gave each other a big bear hug. He climbed into his car and drove away. A warm, gentle man." We resumed our riding, uphill. We need no reminders of the goodness inherent in the vast majority of the people we meet, but Yahaya epitomised it. A different race, religion, and cultural background - it makes little difference. Yahaya, and all the others who have shown us kindness, thank you. Now our riding is over we are temporarily leaving our friends in Penang and escaping the lowland heat for a couple of days by taking a five hour bus ride to the Cameron Highlands, altitude around 1,500m. It's a chance for us to put a full stop to a story that has fascinated us for several years - the mysterious disappearance of the Thai silk king, Jim Thompson. 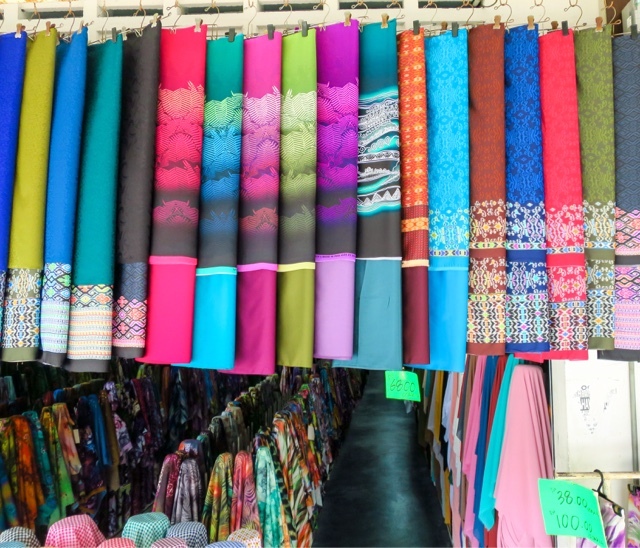 For those of you unfamiliar with his name, Thompson - an American - pretty much reinvented the Thai silk industry in the late 1940s, 50s and 60s. And then he disappeared. Without trace. One day in 1967. He was on an Easter break to the holiday home of friends in the Cameron Highlands, just a few kilometres from where we are staying at Tanah Rata. 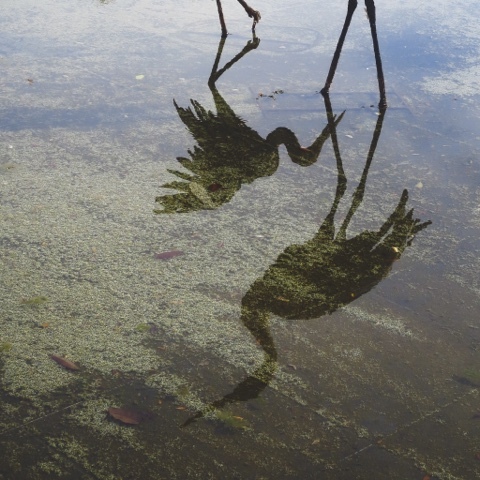 One afternoon he went for a walk and vanished. A massive search took place but no trace was found. Ever since then, theories have flourished about what happened - most of them bizarre and extremely unlikely. The most popular belief is that he was kidnapped (though no ransom note was ever received). Another that he was murdered (no body was found) and yet another suggestion is that he deliberately disappeared to engage in secret work during the Vietnam conflict. This morning we took a taxi up the winding road to the house, known as Moonlight Cottage, where Thompson stayed. Moonlight Cottage around the time Jim Thompson disappeared. And as it is now - holiday accommodation. As the road steepened and narrowed our driver said,"dark" a couple of times and made it clear he did not like the jungle gloom. "Narrower then," he said. "Dark". Today Moonlight Cottage and its neighbour Sunlight Cottage provide holiday accommodation and the owners do not appreciate gawkers like us. Signs warned we were entering private property and only guests were welcome. Signs warned we were entering private property. We pushed on with our driver giving us a tip. Go to reception, he said, and tell them you might want to stay. He was onto it. We had not even opened the car doors before one of the staff was speaking to the driver. We couldn't understand what was going on, but it sounded like he was being questioned about why he had brought us. We made for reception, and did our best to win over a rather stern woman at the counter. She was polite but firm, if not icy. Here was a business card, their rates were on the Internet and we could not go into Moonlight Cottage to look at the rooms as they were occupied. We retreated, snapping a few pictures as we went. It had been a pointless exercise, but having read a couple of books on Thompson and visited his teak house (now a museum) in Bangkok, a spying mission to the place where he vanished seemed like a logical progression. 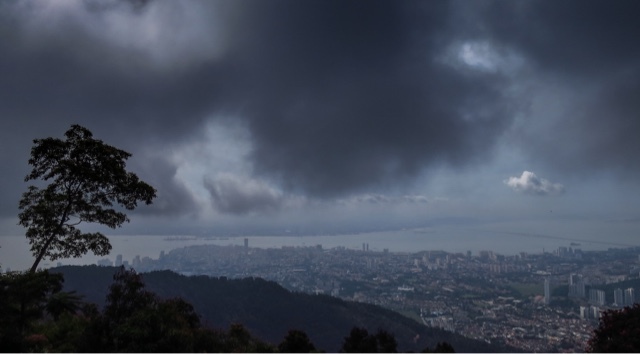 We strolled back down the long hill to Tanah Rata and ate cake and drank coffee - none the wiser about what happened to Jim Thompson. 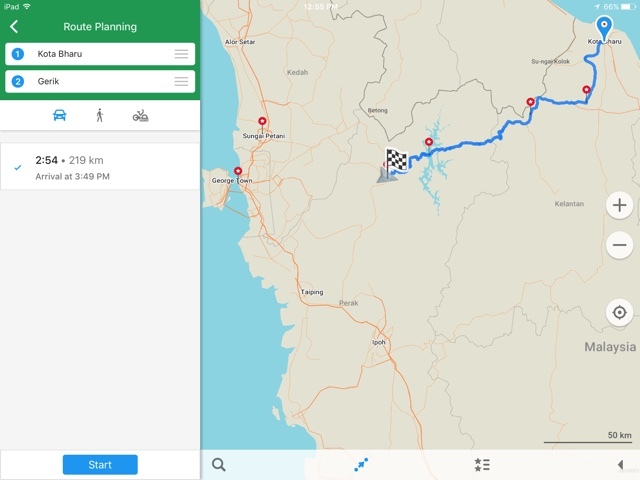 Copy and paste any link into your browser for detailed map routes and stats. 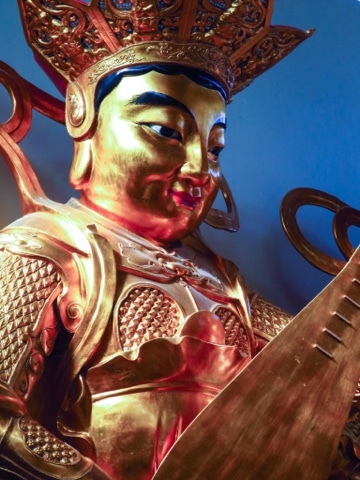 The Eastern Dharma Protector. According to a sign nearby this figure in a Buddhist Tao temple in the Cameron Highlands, the protector looks after the nation. The lute symbolises the need to refrain from acting with undue haste and take a middle path. This is like playing the lute. If the strings are too loose it cannot be played. If they are too tight they will break. "I always knock on the door of my hotel room and wait, asking the spirits for permission to enter. You never know what has gone before." "The target was a hundred days and they did it in eighty," he told us with a hint of pride over dinner. He was a man grounded in facts and figures and mechanics, not one you would expect to be concerned about ghosts in his hotel room. "My father taught me to knock first," he said "and I've always done it. Now I have taught my son." Call him superstitious or whatever, but this trip for us has been one hotel after another and several times I've woken during the night with the feeling that Judy and I were not alone. Often light leaks in from a street lamp outside our window, or around the ill-fitting door. I see a shape outlined against a wall and for a moment think someone is trying to steal our possessions. Occasionally the shape will move, and I don't relax until I realise it's a curtain or our own laundry swaying in the breeze from the air conditioning unit. I drift back to sleep with a sense of relief, but the feeling of someone's presence doesn't disappear altogether. How many other people have slept in this room? Judging by the scuffs on the wall and the way the key jiggles in the door lock, it has had lots of use. What were the circumstances that brought them here? Were they happy occasions or sad ones or, like our friend, straightforward ones - a business trip with perhaps not much emotional baggage. After dinner last night we returned to our room, a windowless box just off reception. At the door Judy paused. "Do you think I should knock", she asked quietly. I nodded. She tapped, waited a few seconds then slid the key into the lock. The room was exactly the way we had left it, but somehow it felt more welcoming. Jungle view as we begin a slow climb upwards on the East West Highway. 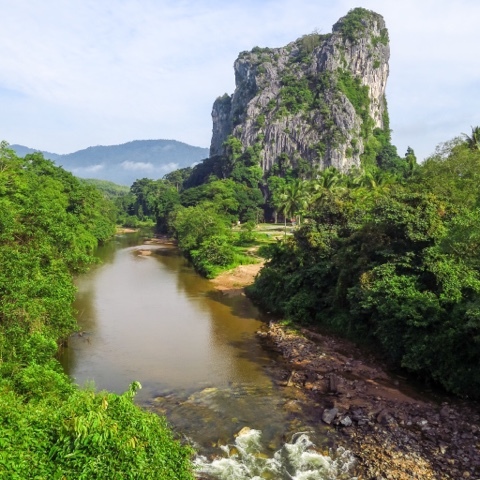 Karst rock towers over Sungai Pergau and jungle about 15km west of Jeli. 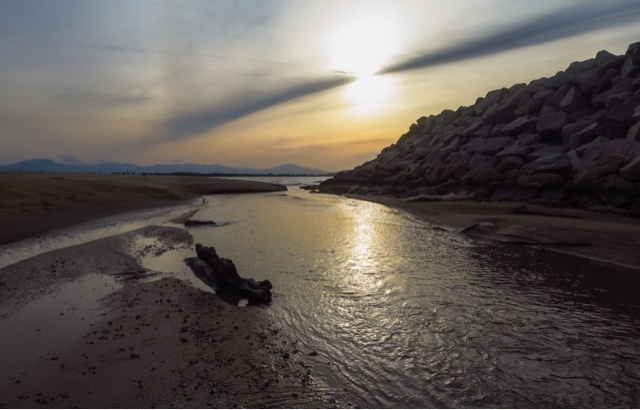 "It's the metal rabbit, turbo coming on," yelled Judy as we crested the last little rise into Gerik, an unremarkable town known as an overnight stop for drivers crossing from one coast of Malaysia to the other. The metal rabbit has become Judy's rallying cry since she was told she was born in the year of the metal rabbit by a Chinese woman. The metal is said to give rabbits more strength, resilience and determination than their lesser relatives. Just what's needed in a touring cyclist, especially in the past couple of days. For more detailed maps & stats, copy and paste the links below into your browser. We have had one particularly tough day - the 90 km from Jeli to Palau Banding, the scene of an artificial lake that supplies water to the Temenggor Power Station. Along the way we rode up a 40 km hill, surely our longest yet. We topped out at over a 1,000 metres and then had a glorious downhill slide for the next 25 km. It was a hot, long and difficult day with occasional relief provided by shade from the jungle and just enough food and fluid stops. Motor scooters gathered at the high point, over 1,000m up. When we reached Palau Banding we discovered the hotel where we had hoped to stay was closed. 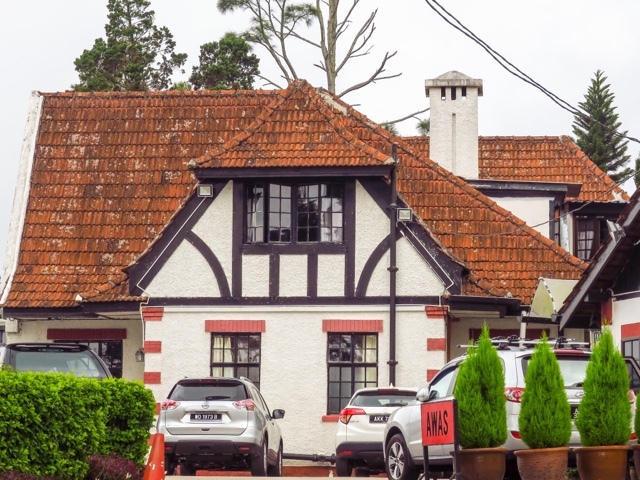 There was only one alternative - the beautiful but outrageously expensive Belum Rain Forest Resort where the only room left was a deluxe suite garden view for RM680 (NZ$236) a night - more than eight times our usual budget. It was wonderful. All polished concrete and glass and bamboo, an outside bath (we used it to rinse our clothes) with a fan, bathrobes, slippers and so modern it didn't have a door on the loo. Belum Rain Forest Resort - RM680 a night and so modern there was no door on the loo. Plenty of room for the bike. We gorged ourselves on the Malay-style buffet (not included in the price), roaming backwards and forwards to the serving tables until one of the staff remarked to Judy that she had eaten a lot. We collapsed into bed, slept the sleep of the truly exhausted and missed breakfast. We managed to check out by midday, had lunch and left to cycle straight into a solid 8 km climb with the temperature over 40 degrees. Sssssh, keep it to yourself but we even walked briefly a couple of times. From the top we had another long descent with a road so good we hardly touched the brakes and clocked 60 kph. 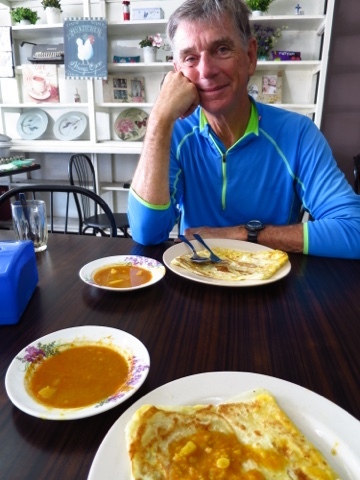 Today has been declared a rest day, and from here we will probably give ourselves three leisurely days to the end of the ride in Penang. 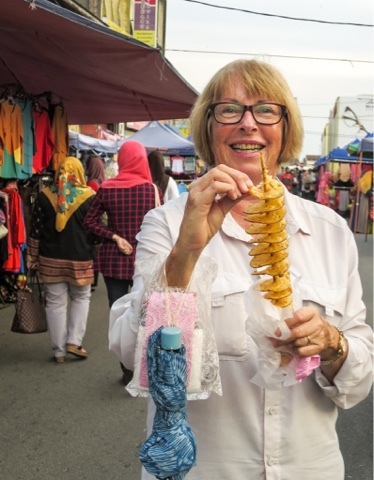 Judy with a goes-on-forever potato chip at the Saturday night market in Tanah Merah. 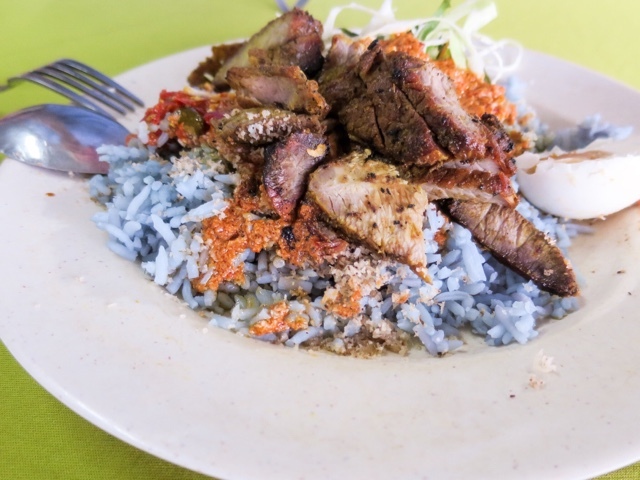 And while we are on food, this is delicious nasi kerabu with its distinctive blue rice. The colouring comes from the petals of butterfly-pea flowers. 100plus is still my favourite energy drink in Malaysia but this pink concoction comes next. It's called Kuku Bima and comes in a packet from Indonesia. Its ingredients are said to include honey, ginseng and black currents. We found it a bit sweet until we watered it down. 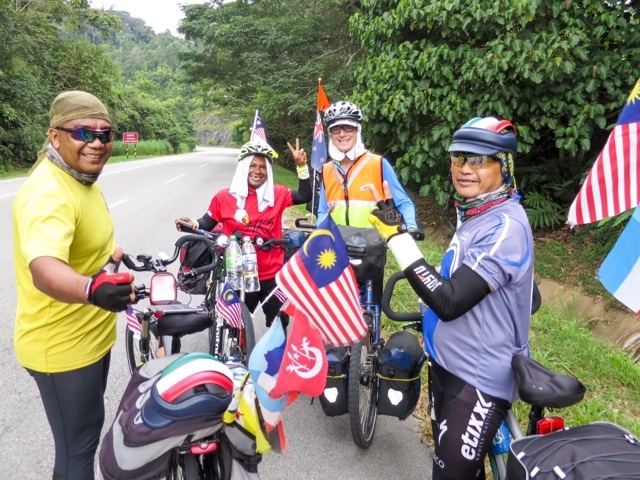 We met these Malaysians cycling the East West Highway in the opposite direction to us. 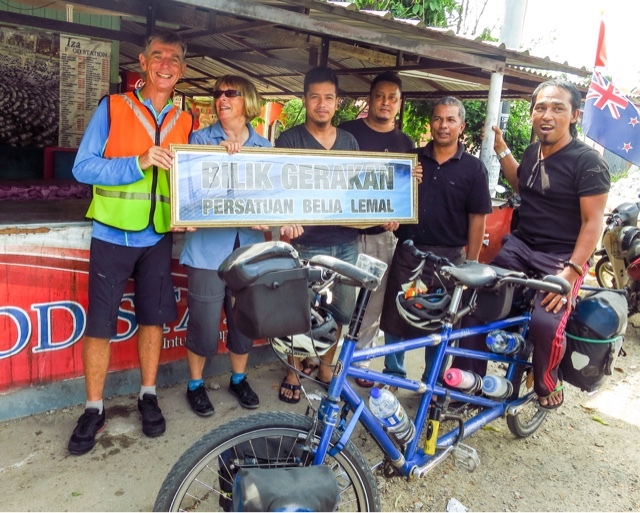 They are only the second group of touring cyclists we have encountered in two months on the road in Malaysia. This group wanted to know all about life in NZ and were intrigued to learn that Judy had retained her maiden name after we married. "Women are more equal in New Zealand," one said. Another said he wanted to come to NZ to find a wife. We still haven't figured out what the sign is about. 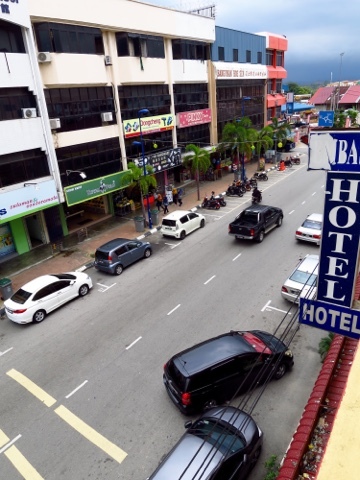 Current Location: Kota Bharu, Kelantan, Malaysia. 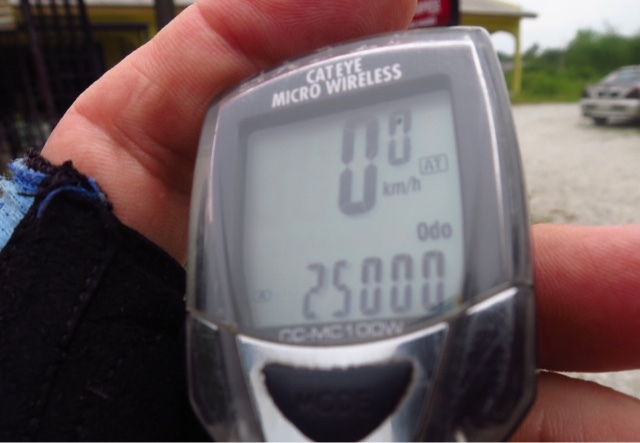 Today felt significant for one reason - the odometer reached 25,000 km. It happened on a very ordinary stretch of road about 20 km south of Kuala Besut. We stopped to recognise this momentous occasion but didn't know what to do, or if in fact we should do anything. In the end we took a selfie, shook hands quite formally and got back on the bike and rode off. 25,000 km is of no particular significance - it's only kilometres and not miles, and plenty of other cyclists have pedalled far further than us. But if you say it quickly, it sounds quite a lot and just think, it's a quarter of the way to 100,000 km. Now that would be an achievement. 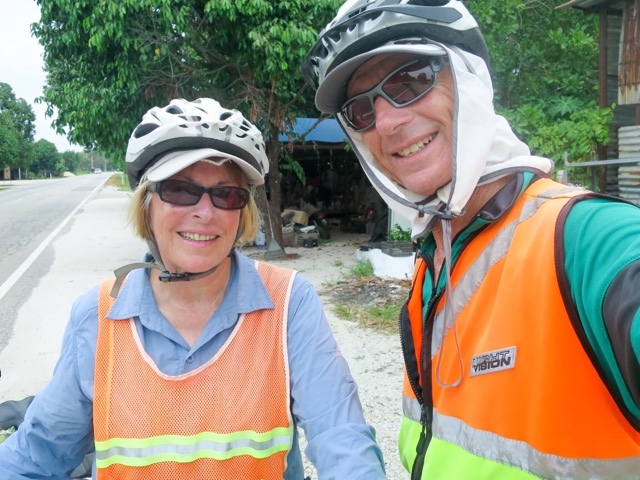 Clocking up 25,000 km cycling together on the tandem. We took a selfie, shook hands and rode off. Our destination was still 20 km up the road. * We have owned the tandem for four and a quarter years. * We have travelled on it for more than half that time, two and a half years, camping or staying in cheap accommodation. 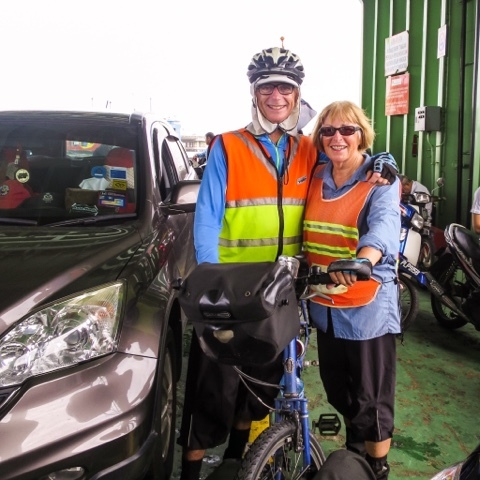 * We have cycled in 25 countries (several of them more than once) in Europe, SE Asia and North America. * We have worn out five pairs of tyres, 10 sets of chains and lost count of the punctures - mostly at the beginning when we were using the wrong tyres. * Both wheels have had to be rebuilt. * Judy is on her second saddle and has a third waiting for her at home. I am persisting with my Brooks leather saddle which harks back to an age when cyclists wore cycle clips on their trouser bottoms and never had helmets. 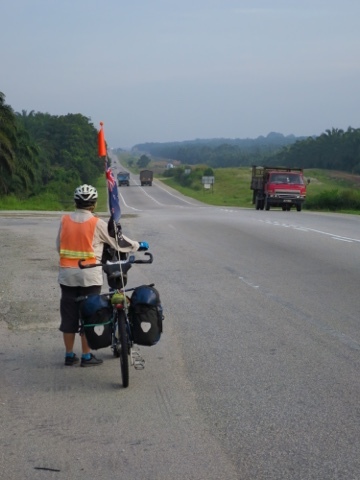 A Day on the Road - 1 August 2016, Kuala Terengganu to Merang, 45 km. A small cheer went up from a big restaurant, and we could see a few arms waving in our direction - encouraging us to enter. It was the staff - there was only one customer, a bad sign at a restaurant. But it was 4 pm - in the dead hours between lunch and dinner - so maybe the lack of customers was understandable. Anyway, we were hungry. We slowed, swung the bike around and doubled back. Five people including a toddler welcomed us, rushed at us with menus, squabbled over us and insisted on posing with us for photos before allowing us to order. "Chicken chop" someone asked, then a bit later "chicken rice - Malaysian recipe." Whatever it was, when it arrived it was good. We drank iced coffee, sat back, relaxed and explained where we are from and where we are going for the umpteenth time. It is hard to have a bad day cycling in Malaysia. 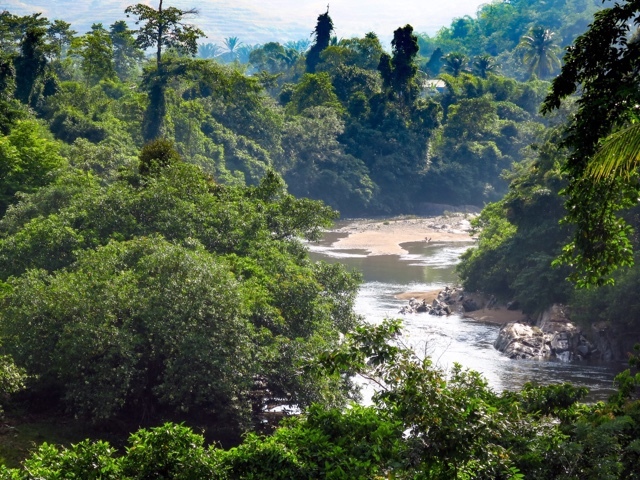 It began with a ferry ride across the river at Kuala Terengganu. Finding the right jetty was the trickiest part, but when we caught the eye of the skipper he looked at the tandem and gave the briefest of nods indicating the bow of his boat. At the other end our hearts sank. There was no ramp, only steep steps. 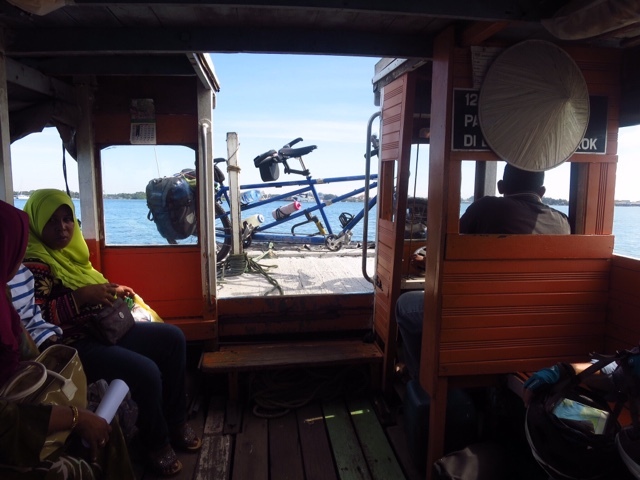 It took four of us to manhandle the bike up, while the rest of the passengers waited patiently to disembark. A short ferry ride across the Terengganu River. It took four of us to lift the bike off the boat when we reached the other side. The ride north was perfect. "Just keep to the coast, go right," Judy instructed as she studied George the GPS on her handlebars. 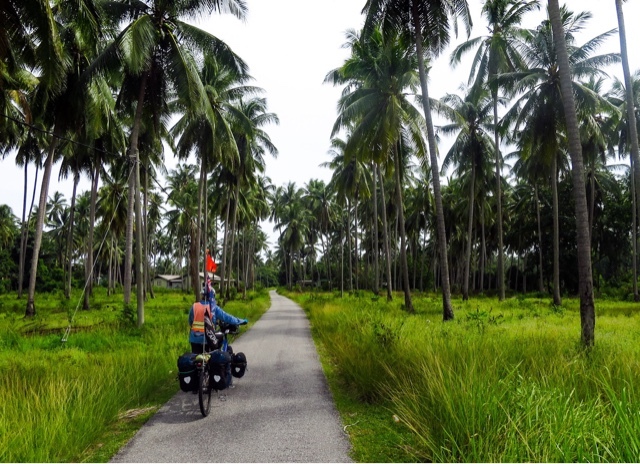 We rode past miles of deserted beach, casuarina trees, coconut palms and kampungs where hens pecked at the dirt and everyone waved. The road was flat and there was no traffic. Above and below: Coastal scenes as we ride north to Kota Bharu. We skirted the airport and at Batu Rakit stopped for drinks of 100Plus poured over ice. "Would you like something to eat, roti canai?" the young man asked us hopefully. He was so polite it was impossible to say no, despite the huge Chinese breakfast we were still digesting. 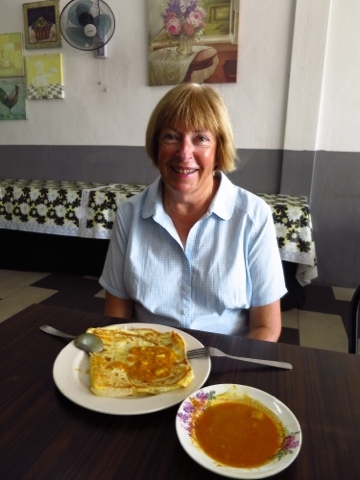 The drinks and the roti canai came to RM6 (NZ$2.06). It's hard to see a profit margin in that. Back on the road we stopped to take photos of what looked like cotton, exploding from pods on a couple of trees. There was no-one to ask so we moved on none the wiser. At Merang - one of the jumping off points to popular Redang Island - we stopped to look for somewhere to stay. The bike fell heavily against a concrete post and now has a bad dent in the crossbar. Somehow it doesn't seem to matter. The bike still goes. A quiet backroad that went on for kilometres on the last leg to Kota Bharu. Coconut gathering team. 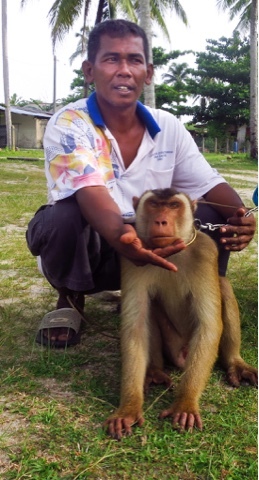 This man had two monkeys on long leads. This one was the star performer. With a few quick twists he would dislodge a coconut and send it plunging to earth. We found a "chalet". Why after all these weeks does the word still remind us of Swiss mountains and cuckoo clocks? Our chalet and the others alongside it is rundown and badly in need of more than a coat of paint. They stand in a delightfully overgrown garden. There appears to be no other guests. Our chalet has a squat loo and air con but no tv, wifi or hot water and the mosquitoes are already lining up to invade through the gaps around the door. But the bed looks comfortable enough, we have eaten, washed off the sweat and put up the mosquito net. It's hard to have a bad day cycling in Malaysia. 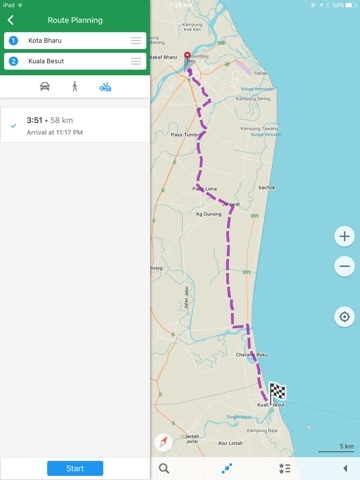 Kuala Besut to Kota Bharu - approximate route only, about 70 km. We stayed closer to the coast on the D11, then carried on through Bachok and Kampung Tawang before cutting inland to Kota Bharu. Current Location: Kuantan, capital of Pahang and Malaysia's second biggest port. Distance Cycled This Trip: 1,198km. Hotel Costs in Sarawak, Sabah and Brunei tend to be at the higher end of the range, with peninsula Malaysia lower. So far we have met four other touring cyclists on this trip, and they were from Auckland, NZ. Tristram, Wayne, Paul and one other (whoops, forgotten name) were following a similar route to us up the east coast of peninsula Malaysia. "How do I look," asks Judy the Stoker. "Fine," I say. "Oh no, bit of loo paper on your cheek." Judy has been using a scrap of toilet paper to wipe away the sweat. She brushes her cheek with her hand and smiles. "N.G. for G.G. (Governor General)," she says referencing the Australian comedian Norman Gunston who famously stuck toilet paper on his shaving cuts. "Fine," I say, both of us ignoring the stripe down the middle. Judy badly needs a hairdresser but is determined to hang on till she can go to her favourite in New Zealand. She tucks her cycle helmet under her arm and heads for the swing doors to the hotel lobby, to find us a room. One of our favourite places on this trip. The Chief's Rest House in the Royal town of Pekan, Pahang state, Malaysia. Built in 1929, the wooden bungalow creaked with atmosphere. 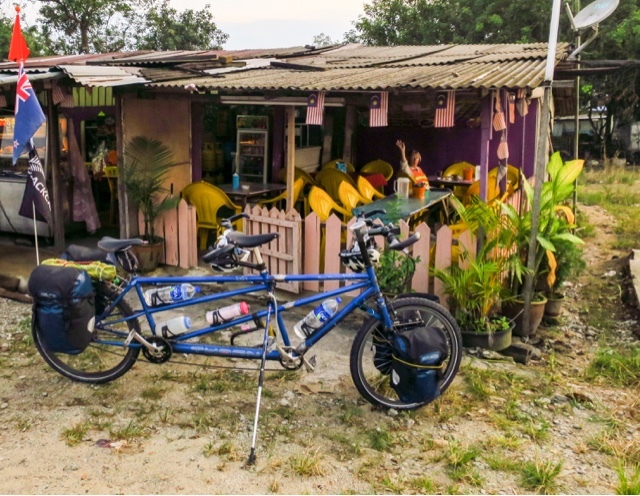 In the picture, our tandem is parked on the verandah but there was plenty of space to put it inside our room. It is a familiar routine. I put the tandem on its side stand, pull a water bottle from its rack and stand guard over the bike to wait. A few minutes later Judy emerges, giving me a discreet thumbs up. That means a lot of things - she has found us a room for the night, the price is right, it has air conditioning, there is somewhere to store the bike and wifi is available. All of them are crucial. Judy conducts research from our room at the Chief's Rest House, Pekan. 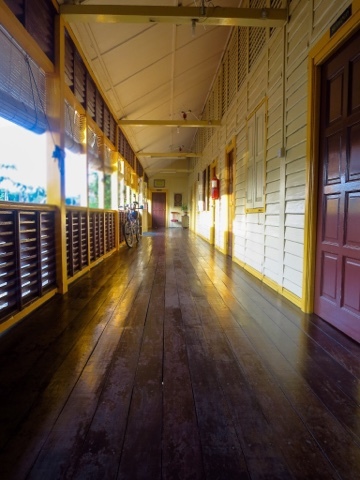 Wooden floors where guests and staff all walked barefooted - as good as summer grass between the toes. Room to move, a kettle, a bathroom with a resident snail for company and air con which only stopped working for a couple of hours. Bliss. All this for just RM55 per night. We do not (generally) book in advance, which some people might think strange. Why not make it easy for ourselves by going online the night before? The reality is that we often don't know where we will end up - road conditions, sights along the way, a puncture, even our own energy levels can all force us to change our plans. We do not want to be locked in. Sometimes we are unaware if a town on our route even has a hotel. So far on this Malaysia trip we have only been caught out once and instead we found a (pretty dreadful) room to rent (a "bilik sewa"). One of our less satisfactory stays. We went looking for a "local" beach resort instead of one overrun by foreign tourists. Sadly, we chose a village called Air Papan, north of Mersing. One resort was too expensive, another was full and we ended up in this place for a night. It may look romantic, but rain was destroying the wall linings, the loo smelt and the air con was locked on 16 degrees and poured buckets of frigid air on us until we finally turned it off. RM80 a night. Another advantage of just turning up is that it gives us the opportunity to check out our chances of storing the bike. One way or another, we always get it off the road but a hotel with a ground floor reception makes life a lot easier. Once Judy has sweet talked the person on the front desk, we roll it in through the front door and park it in front of them, or in a corridor not far away. 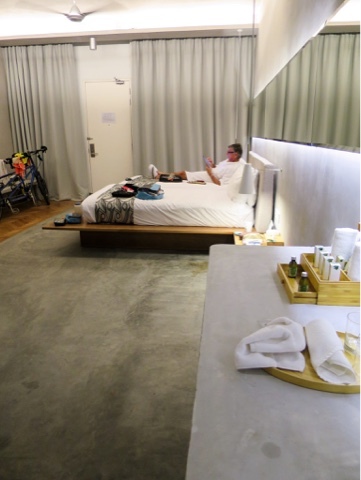 Often the really cheapest hotels have their reception areas on the first floor and the bike has to be person-handled up stairs and around tight bends - not much fun when we are hot and tired. 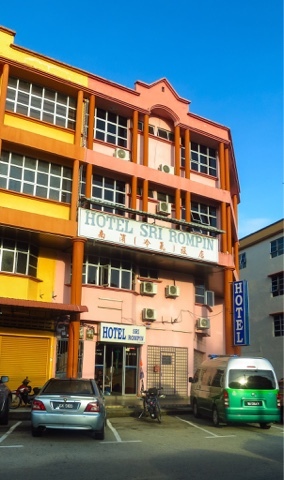 This hotel in Kuala Rompin has a key ingredient - reception on the ground floor. We were able to push the bike through the swing doors and park it in a huge storage area out the back. Our room was up on the first floor and it had another important ingredient - a window. Almost as bad are hotel lifts. If there is no room downstairs, we can at a pinch get the tandem in a lift. But it means removing all the panniers and making sure they are safe while we angle the bike into the lift so that the front wheel is jammed against the roof and the back wheel is stuck in the far corner. It is harder than it sounds. As we try to get the bike in, the lift doors will be trying to squash us, the bike or any onlookers who get too close in their enthusiasm to capture our strange behaviour on their camera phones. So when Judy emerges from a hotel and gives that discreet thumbs up, it is a heartening moment. We can both look forward to showers, time to relax and maybe even a beer if we can find one in this predominantly Muslim part of Malaysia. "So much goes on in a day, you get up, cycle and have no idea where you are going to stay that night." Maps & Stats - copy and paste links below into your browser. 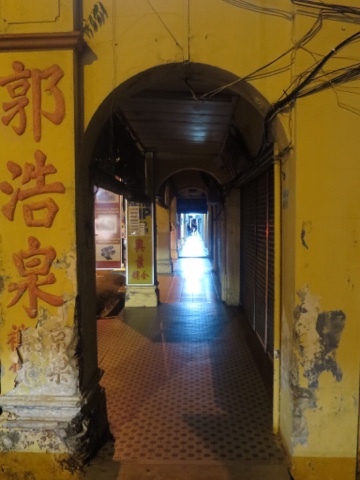 A few old Chinese shop houses remain alongside the river in Pekan. Reflections of wooden sculptures outside the (closed) museum in Pekan. 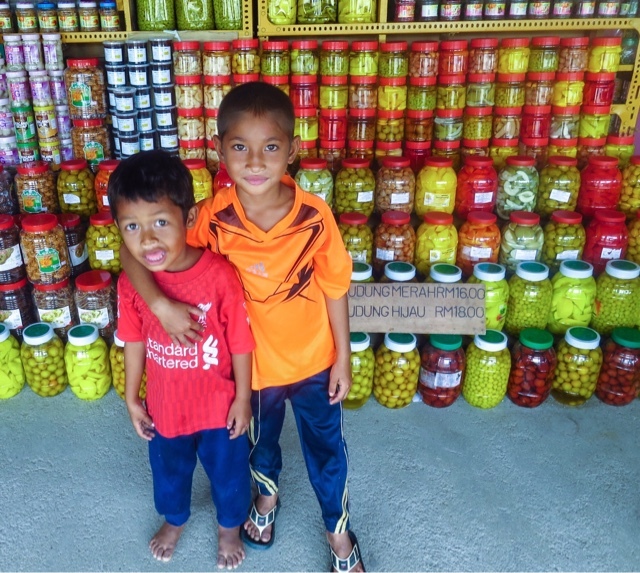 We met these two when we stopped at a roadside stall selling fresh pineapples and preserved fruit. They were particularly interested in the bike and spun the pedals til we got bored. We figured the one on the right was going to be up to all sorts of mischief when he's older. 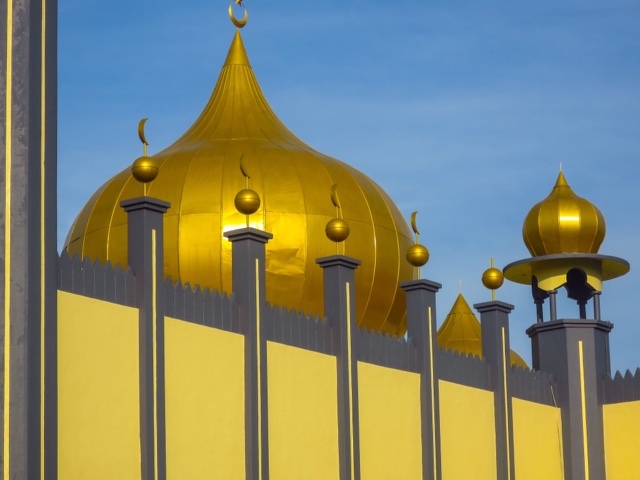 One of the gold domes on the Abu Bakar Mosque in Pekan. 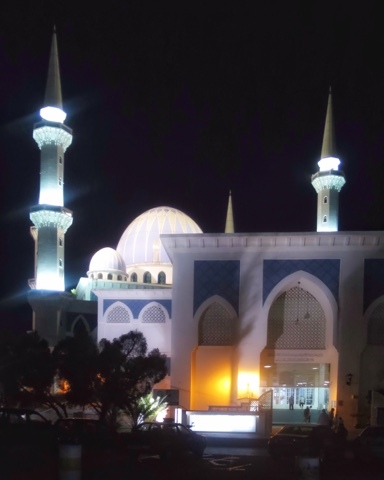 Another mosque, this time in Kuantan. Completed in 1993, it reflects some of the architectural style of the mosques of the old Ottoman Empire. 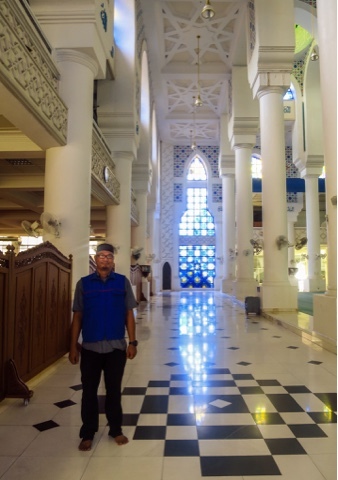 We took off our shoes and were taken on our own guided tour of Kuantan's mosque. It wasn't as long as we would have liked, but we saw enough to just about satisfy our curiosity. One of those quirky bits of information we gleaned - new to us at least - was that the hats worn by men are to stop their hair falling forward over their faces during prayers - an absolute no no. Our guide laughed and showed us his bald head. He just liked his headgear. Health Status: Chaffing in all the wrong places, both of us with one bung knee. Was it resentment at being stored in the left luggage room at the airport's frozen fish shop? Was it the final ignominy when I reached into his cardboard box and let the air out of his tyres so they wouldn't burst in flight? Or was it simply carelessness on the part of the Air Asia ground staff at Kota Kinabalu airport? Whatever the reason, the Beast of Bridgwater (BoB for short) failed to board our plane to Senai, the airport that serves Johor Bahru, near Singapore. We collected our panniers off the baggage carousel and waited expectantly at a door where we figured the oversize baggage would emerge. An hour or so later, our fears were confirmed - the Beast never made it onto the flight. Worse still, he could have been put onto another flight, perhaps to Kuala Lumpur. Instead of cycling to a hotel, we caught a taxi and waited. At 12.30 am, the phone rang and I slipped downstairs where the Beast was being delivered. It took three of us to extract him from the car, he had been wedged in so expertly by the driver. 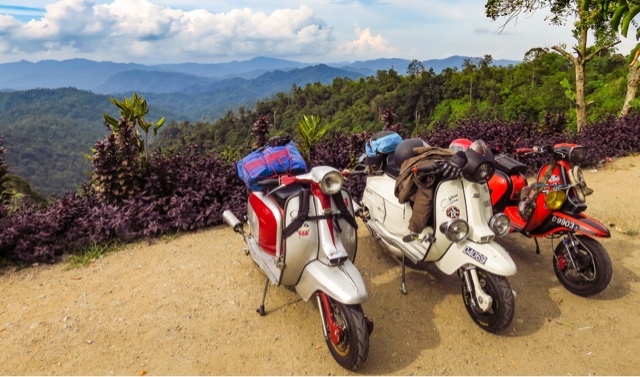 It has taken two days ride to get from Senai to Mersing, on peninsula Malaysia's east coast. The first day's ride was a straightforward 49 km. This photo was taken on the second day when we had to knock off 92km. To avoid the worst of the heat we set off in darkness shortly after 6 am. We were at our destination by 2 pm having averaged 16.8 kph. We were pretty pleased, especially as we avoided an afternoon downpour. Early morning breakfast stop - buffet style, sausages, fried eggs and vegetables. We shoved him behind the reception desk and I went back to bed. But sleep wouldn't come. It's the first time the tandem has gone adrift in our travels and although we had been confident of getting him back, it was unsettling. It took Judy and me two hours to reassemble the bike on the footpath, and the sweat was running off us by the time the job was finished at 9.30 am. We needed showers and a change of clothing before we could face breakfast. Our plan was a short ride of 45 km to Kota Tinggi, but our start was delayed even further by one of those delightful meetings we have learned just to accept and enjoy. The kopi kedai (coffee shop) where we had breakfast has been run by the same family since 1972. 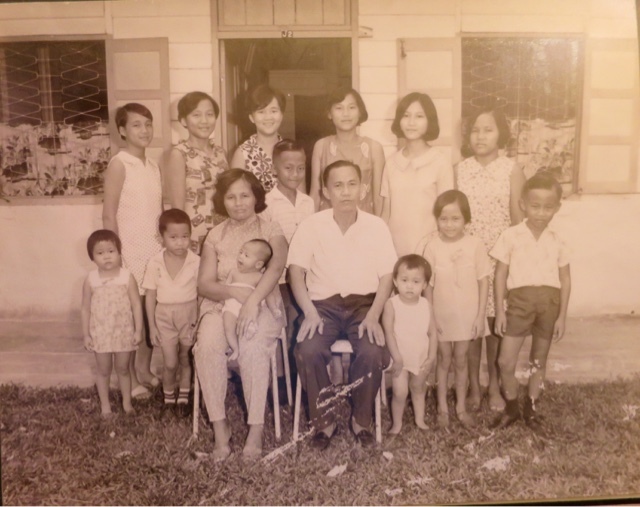 Mum and Dad started it, and now all these years later several of their 14 children are involved. They were delighted to show us old photos and their pride in the business was obvious. 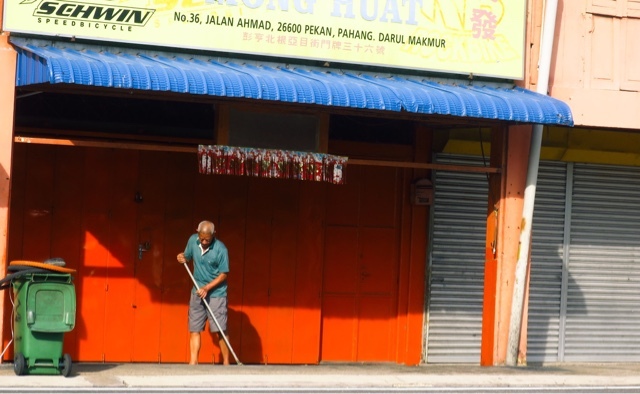 For 44 years the same family has run a coffee shop in Senai. Like so many people in this part of the world they were welcoming, especially when they learned we were a couple of kiwis riding a weird bike. Mum, Dad and 13 of the 14 children - several of whom are working at the coffee shop. By the time we emerged, the rain had stopped and it was nearly midday. Fortunately, the ride was straightforward and by mid-afternoon we were checking in to a newly opened hotel with gleaming tile floors, a tv with hopeless reception and a windowless room. That was three days ago, and now we are in Mersing on Malaysia's east coast. The town and the faded Empire Hotel where we are staying are our kind of places. The town has not undergone the mall makeover that seems so common in Malaysia. The hotel is rumpty but clean and comfortable and we have big windows that let us watch the weather and the street below. The tv doesn't work. Perfect. Windows on the world. Many of the cheaper rooms in budget/midrange hotels are windowless boxes. The perfect hotel room. Air con, own bathroom and room to spread our gear - a shelf up high for the helmets and coat hangars for our rinsed out clothing. 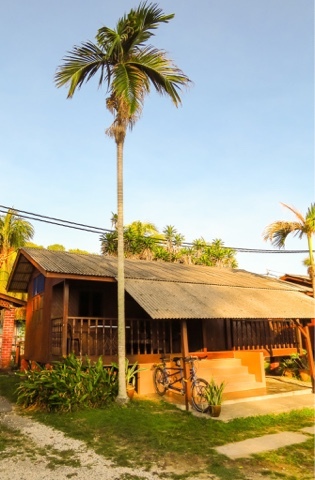 Mersing is the jumping off point to Pulau Tioman (anyone old enough to remember the Hollywood musical South Pacific? 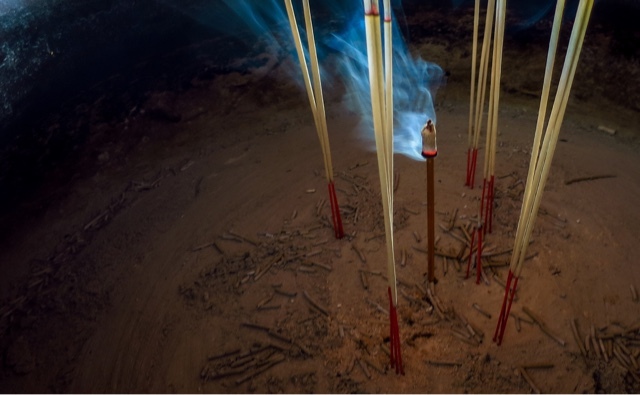 It was filmed on Tioman). 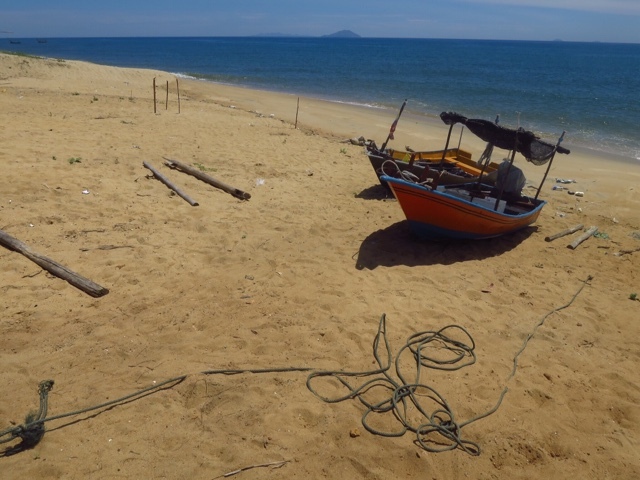 Since before we arrived here, we have been talking about going to Tioman, or one of the other 63 volcanic islands that make up the Seribuat Archipelago. Backpackers converge on a ticket office for ferries to Pulau Tioman. But we just can't generate the enthusiasm. 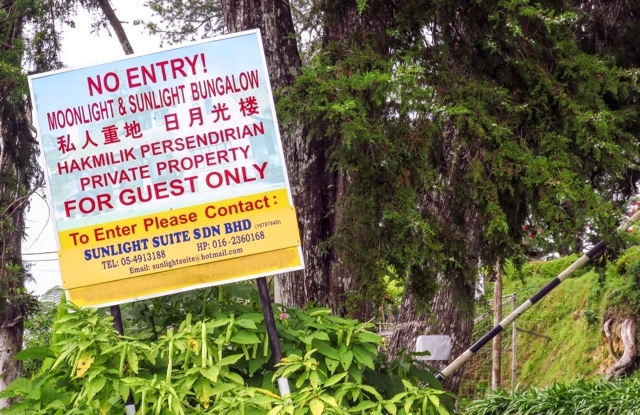 Tioman in particular is backpacker territory, and while the resorts on some of the other islands look attractive we just can't see ourselves lounging around a pool. 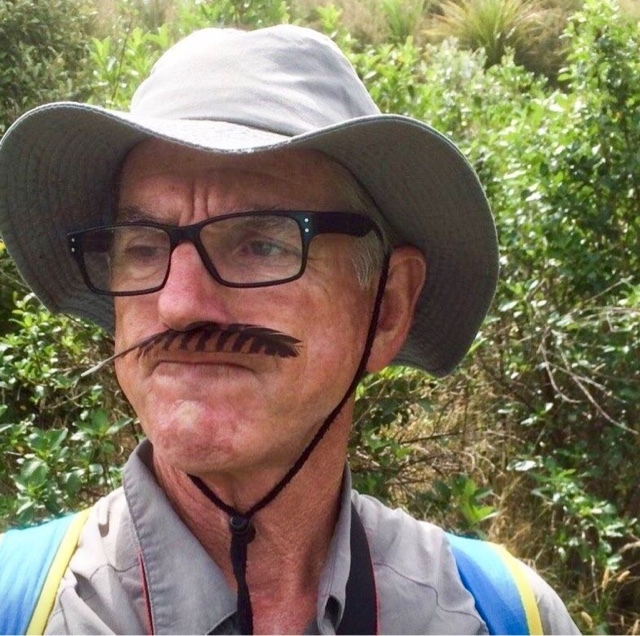 So tomorrow we are going to unshackle BoB from the handrail by the stairs and point his front wheel up the coast to a Malay settlement where we know there is at least one very small, local resort. It sounds more our style. "What are you doing," asked Judy lifting her head from her phone and her game of Words with Friends. 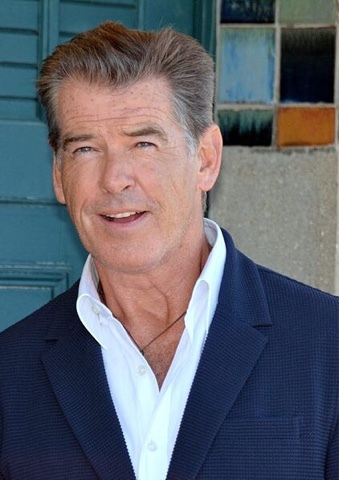 "Um, just looking, googling Pierce Brosnan actually, to remind myself what he looks like." "Not like you," said Judy returning to her war of words with someone 8,000km away. After a while she peered over my shoulder to look at the picture I had up on screen - Brosnan in one of his more recent acting roles in The Ghost Writer. "It's the hair, you've got lots of it, just like him." "What about the face? The bone structure?" But she wasn't buying into it. She'd already returned to her game. This attempt at a comparison came about because we met a modern young Muslim couple in the street recently. As we drew nearer, we acknowledged each other and fell into conversation. They were married, he had moved from KL so they could be together and he was researching various trees for their potential use as a source of scent for cosmetic products. He dabbed some samples on the back of our hands and looked pleased when we said one reminded us of pine resin. It was about then he said,"I thought you were Pierce Brosnan walking down the street." Judy laughed. She can be so undermining at times. "Don't tell him that. He'll want a movie contract, and the money." I noticed his use of the past tense, as if saying "I originally thought you looked like Pierce Brosnan but now you are up close, I don't anymore." We chatted some more and they headed off hand-in-hand, she in her fashionable clothes and colourful tudung (headscarf), he with his bag of samples over his shoulder. Both of them with their hopes for the future. I went off to check bone structure, but I fear Judy is right. Maps & Stats - copy and paste link to your browser. Tandem Touring - Is It Better Solo? 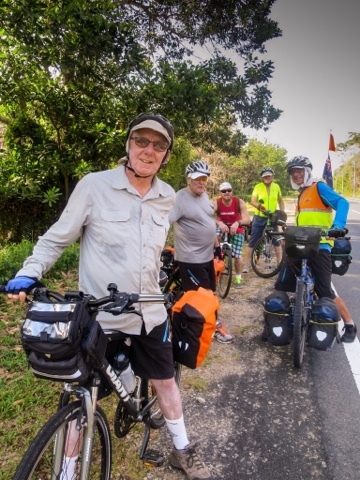 We are two New Zealanders who gave up our careers in our early 60s to go cycle touring on a tandem - to see something of the world before age and creaky knees caught up with us. We love our life on the road and hope we can - in some small way - encourage others to worry less about money and more about enjoying each day.